NEW YORK (CNS) — At the Basilica of St. Patrick’s Old Cathedral in Lower Manhattan, Polina Maller, 11, took a few moments from her violin lesson to talk about her appreciation for music. “It’s fun, and I like it. Music makes me feel like I’m free inside; it makes me feel like I could create things, and then I feel good about myself,” Polina, a classical music aficionado, said July 26 in an interview with Catholic New York, the archdiocesan newspaper. She was midway into a week of a summer music camp on the cathedral grounds. 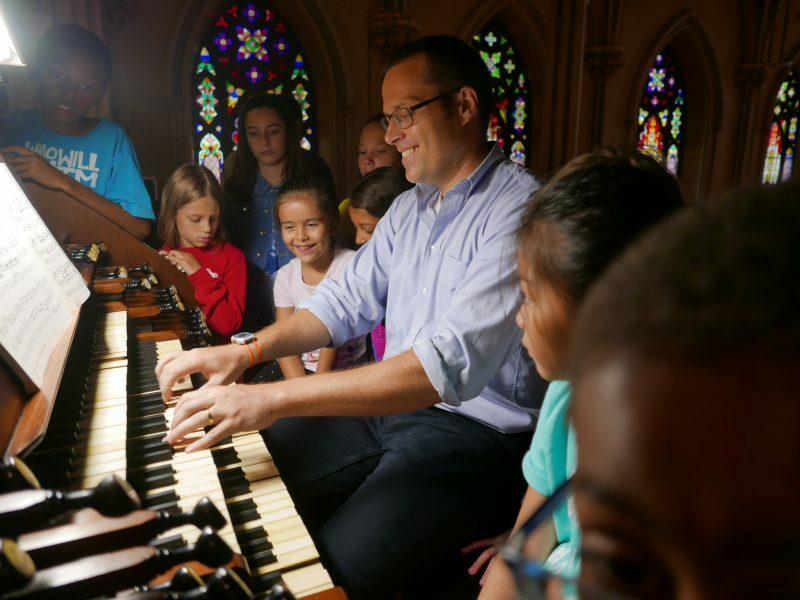 Eleven children took part in the first-time program, “Pipes, Pedals & Peals,” sponsored by the Friends of the Henry Erben Organ. The group is a charitable organization devoted to the conservation and restoration of the 1868 Henry Erben Organ inside St. Patrick’s Old Cathedral. The five-day camp, which operated three hours each morning, was open to children ages 7 to 12. Organizers expect to make it an annual summer program. The Friends group also supports live musical performances, education and training of young musicians and organists, after-school music education programs and organ demonstrations, coordinators said. In addition, it supports concerts for visiting tour groups, arts and cultural organizations, schools and universities. The week’s activities for the music camp children included lessons in playing the violin and handbell chimes, and hands-on lessons about the history, uniqueness and intricacies of the Henry Erben Organ –- yes, hands-on, they got to play the special organ. Polina played a prelude by Bach. The wood Erben Organ has three manuals, or keyboards — an organ keyboard played by the hands is called a “manual.” It stands about 45 feet high and has 2,500 pipes. “It’s about the size of a small apartment,” said Anne Riccitelli, president of the Friends group. The children also assembled a special kit, creating a small, functioning organ similar to the Henry Erben Organ. The Orgel miniature organ kit was developed in the Netherlands; it is an educational organ that measures about 3 by 3 by 2 feet, weighs more than 40 pounds, and has about 48 pipes. Additionally, the children performed at a summer camp recital — with violin and handbell chimes — during a July 30 Mass at St. Patrick’s Old Cathedral; the liturgy, celebrated by the pastor, Msgr. Donald Sakano, was followed by an Erben Organ demonstration, and later a festive reception in the undercroft. The cathedral’s organist is Jared Lamenzo, who gave the demonstration. The children casually played the small organ at the reception. “They’re learning a lot in one week -– the small organ will help them understand how the big organ works,” Lamenzo said while the children were learning how to play the handbell chimes July 26, a lesson given by Michael Bodnyk, a cantor at both St. Patrick’s Old Cathedral and St. Patrick’s Cathedral on Fifth Avenue, the mother church of the New York Archdiocese. Robert Hodge, 10, also was among the music camp children. “I love the class, and the teachers are nice. It’s very educational,” Robert told Catholic New York. Machado writes for Catholic New York, newspaper of the Archdiocese of New York.